The worst situations will often bring out the best in people: the best ideas, the best workmanship, and the best teamwork. Tree removal always presents issues, but extremely dangerous trees require extra precaution to solve the exponentially greater risks to life and limb. 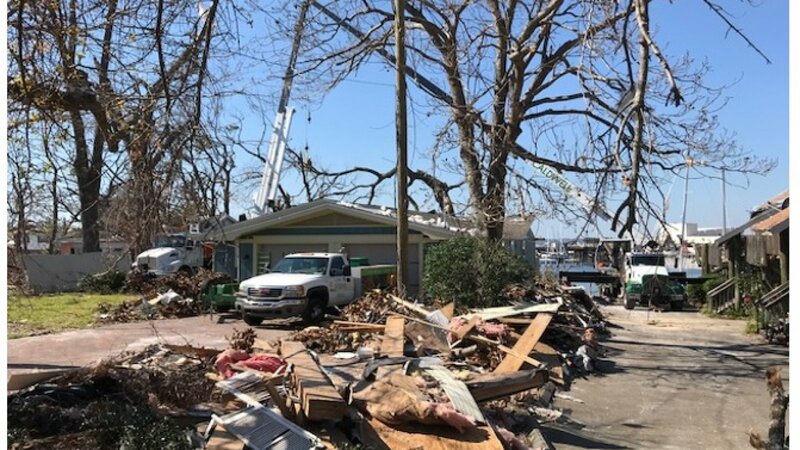 Such was the case presented to one of the teams from Caldwell Tree Care after Hurricane Michael devastated the eastern panhandle of Florida. Panama City, Florida lies directly on the Gulf of Mexico and is less than 25 miles from where Hurricane Michael made landfall on October 10th, 2018. Michael was rated at a Category 4 hurricane at the time of landfall and had measured sustained winds of 155 miles per hour. Very few trees, if any, can stand up to that level of punishment. 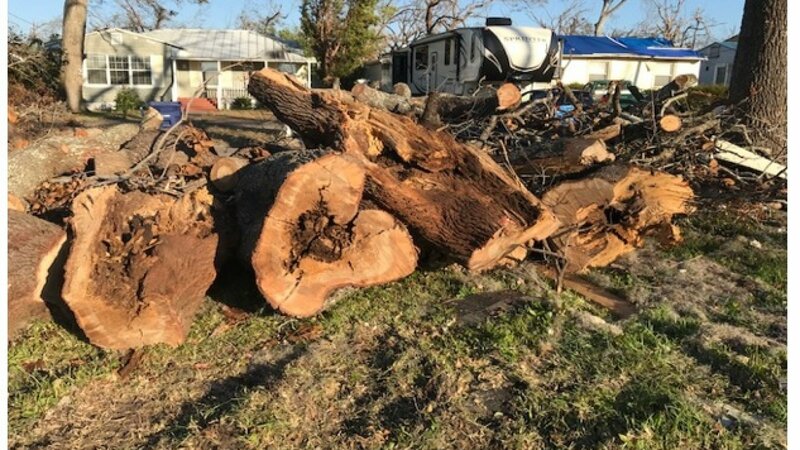 One tree in particular failed during the storm and Caldwell Tree Care was referred, by the homeowner’s insurance, to facilitate removal from the structure, to provide access for storm damage repairs. The tree was a 52” Live Oak, Quercus virginiana, which had broken above the roofline of the single story structure and had laid partially upon the roof and had pulled/heaved near the home’s foundation. 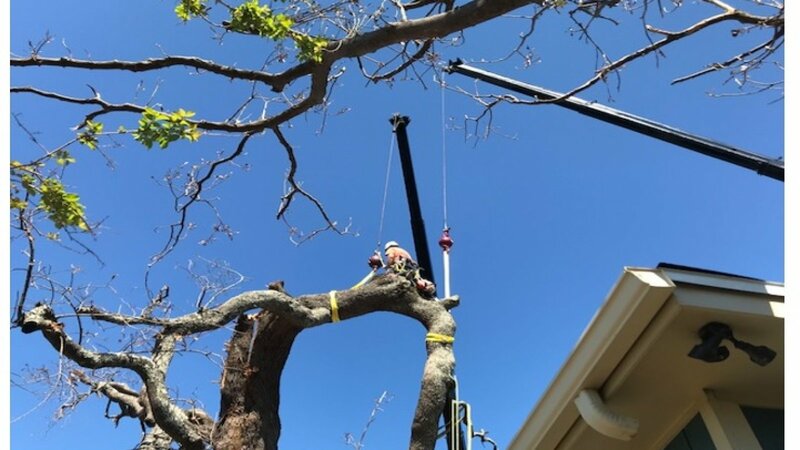 Arborist Josh Jarvis completed the initial ground inspection and secured the contract, including the need for Caldwell Tree Care to set up their 38 ton crane in the neighboring apartment complex’s driveway. The complex was also a Caldwell client. 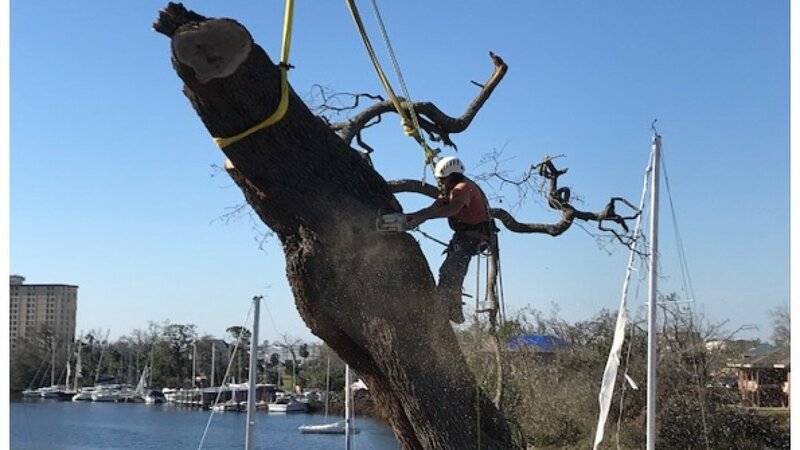 The production team from Caldwell arrived on October 30th, 2018 to remove the oak. The crew consisted of Operations Manager Terry Ferdarko, CTSP; Crew Supervisor Mike Bederian; Groundsman Wayne Germon; and Arborist Andy Farbotko, CTSP. 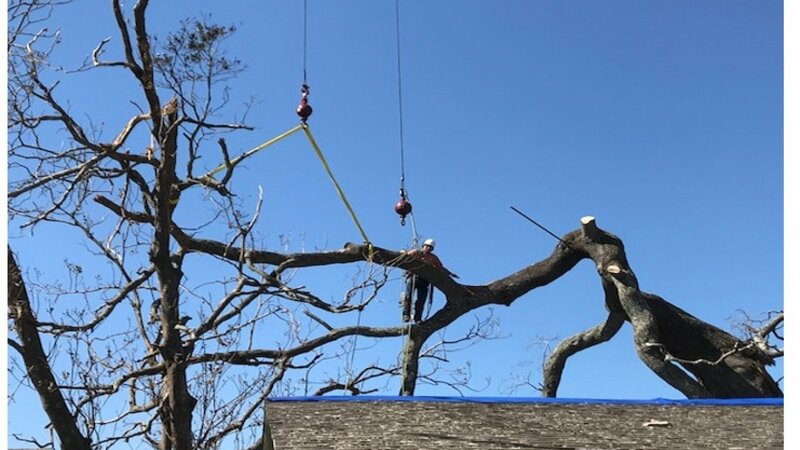 The crew inspected the tree from the ground and from the roof and found that there were extreme challenges within the removal that could not be safely overcome with only the equipment they had with them. The tree had broken three quarters of the way through the main trunk, twisting around onto the house with three large leaders supporting the weight of the canopy on the structure, 3 leaders located above the structure, and two leaders which were not on or above the structure. All leaders were 12-24” in diameter and all, except the small 12” leader, were above the break in the trunk. The tree had a “Rams’ Horn” defect running up the trunk to the leaders where it failed, but the wood inside, or lack of wood, could not be ascertained. A large 20” leader had also ripped completely off and was lying on the ground. The damaged structure backs up to a bay, and the sea wall down to the bay was affected by the hurricane’s storm surge, which limited how far the crane could be set up in the neighboring driveway, thus creating a longer distance for the boom to reach and reducing lifting capability. The more pressing issue though, was the tree was not safe to tie into while making cuts as it did not have enough holding wood where it had split and there was no other tree in the area that would allow for tie in, nor could the 75 foot bucket truck onsite reach where the crew needed it to. The team discussed various strategies and the decision was made by Terry Ferdarko to bring in a second Caldwell crane that would allow for a tie in point that could be repositioned as the climber choked and cut the tree above the trunk failure. A call was made for Caldwell crane operator Mike Gullicksen to bring the 23 ton crane from the project he had completed with his crew and station it on the paver area in front of the structure. This was possible due to the smaller footprint of the 23 ton crane. Work and landing areas were cleared of debris and both cranes were set up. Terry Ferdarko operated the 38 ton crane, while Mike Gullicksen operated the 23 ton crane. Mike Bederian was climber on ball, Andy Farbotko was positioned both on the roof and ground as the job progressed, and Wayne Germon was positioned on ground. Bluetooth headsets were used between Terry Ferdarko, Mike Bederian, Mike Gullicksen, and Andy Farbotko to ensure complete communication at all time between the cranes and the climbers. 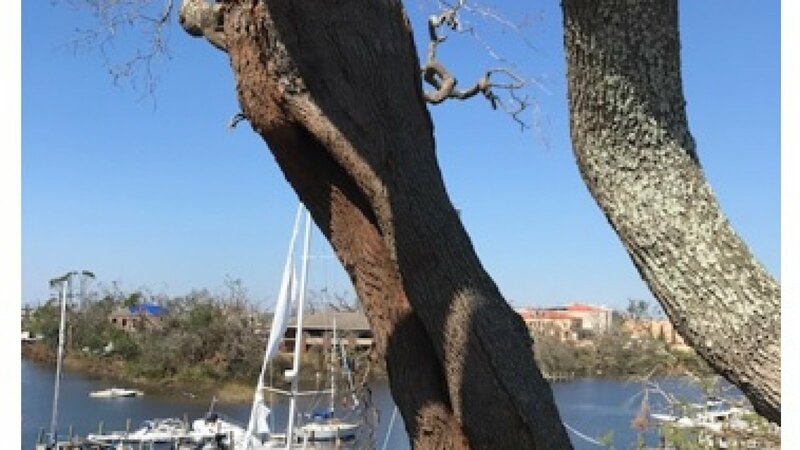 Due to the nature of live oak trees, especially when growing right off the water, the limbs were gnarled and twisted, making larger cuts more difficult, as did the weight of the wood, at 90 pounds per cubic foot. 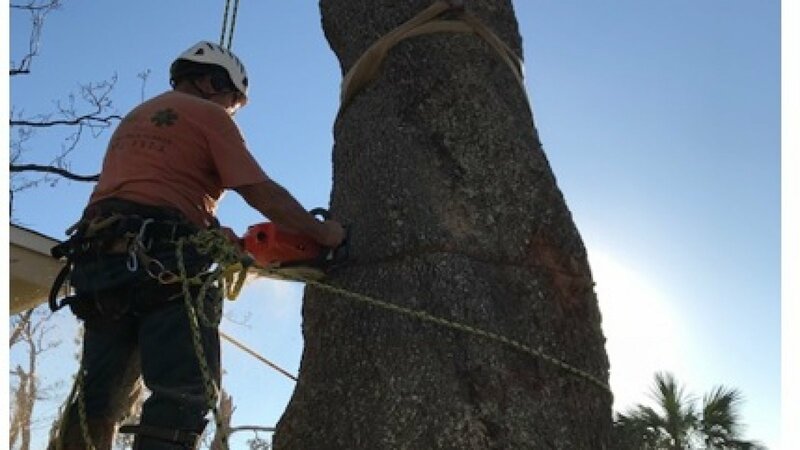 Most of the cuts were limited to less than 2000 pounds, not just because of the weight, but because the form of the tree required caution to allow for clean crane picks. Mike Bederian was tied in to the 38 ton at the start of the job and the 23 ton was used to remove most of the brush as it was closer to the crown and had a wider landing zone. The tree was brushed out, leaving only the three pressure points on the roof and the small 12” limb on the backside of the tree. This limb was left as a tie in point for switching between crane balls. At all times while cutting, Mike Bederian was tied into the safety ring above the crane ball and had a work positioning lanyard as a secondary tie in. and chokers were put around the limbs to allow the cranes to switch in holding the failed tree as Mike Bederian made the cuts, tied to whichever crane ball allowed better positioning. On two occasions, the safest option was to cut from the crane ball actually doing the pick and descend to the roof once the load was cut, and then be picked back up from roof on the return crane swing. After the tree had been completely removed off the structure, Mike Bederian was able to stay tied in to the 23 ton crane. This however, brought about new issues as both crane booms and cables now had to be controlled within 3 to 4 feet of each other to allow cuts on 36” plus wood. This was completed by the careful guidance of Terry Ferdarko in controlling the load as it came off and Mike Gullicksen placing Mike Bederian in a position that allowed the proper cut without being in harm’s way. As dusk arrived, all that was left was 15 feet of the trunk which was cut the next day from the deck and ground for the 38 ton crane. All wood was cut to a manageable length and was staged in accordance with FEMA debris removal standards. In all, over 30 crane picks were made to remove over an estimated 60,000 pounds of tree. A Coordinated Team Effort Saves the Day!